New | Softbound | 352 pp | Size: 8" x 10"
The Herbalist's Way extensively covers all the aspects of dedication to understanding and using useful plants. 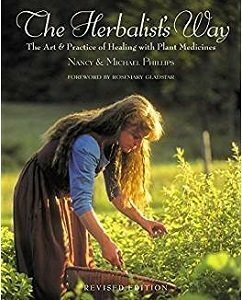 The book includes information on growing, drying, and preparing medicinal herbs, learning to listen to clients and recommend holistic treatments for healing and continued wellness, as well as licensing, marketing, and other legal and business issues facing modern herbalists. Nancy and Michael Phillips run Heartsong Farm Healing Herbs in New Hampshire, where they grow and sell healing herbs and herbal products. Nancy leads workshops on herbal medicine, and Michael writes for Mother Earth News and The Natural Farmer.